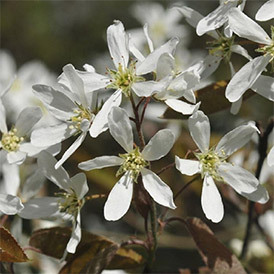 A group of small deciduous trees or shrubs, that produce an abundance of white flowers in spring, followed by glossy red or purple/black berries. The foliage provides striking orange and red autumn colour. An ideal choice for the smaller garden and a good versatile all rounder. The berries ripen mid-summer and are edible, with a taste similar to blueberries - so long as the birds don't get them first! Foliage: Light-green deciduous leaves, with a bronze-tinge, turning to fiery oranges and reds in autumn. Flowers: Showy white star-like flowers on short lax racemes. Often showing before the leaves appear. Soil: Moist but well-drained, lime free, soil (clay, sand or loam). Acid or neutral pH. Dislikes very wet or very dry conditions. Conditions: Full sun or partial shade, any aspect, exposed or sheltered. Habit: Slow growing, bushy, erect, open habit. 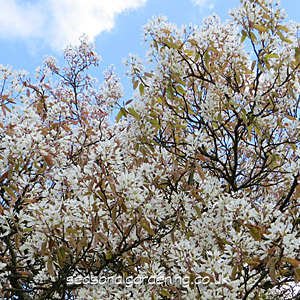 Easy to grow tree/shrub that is ideal for the smaller garden. They will thrive in a sunny sheltered position, so long as the soil is moderately light and moist. They won't do well in lime or chalky soils. Usually purchased as a container grown plants that can be planted any reasonable time of the year but October and November are the best months to plant. Water well in dry weather until established. Suckering species may need removal of thin superfluous growth. Prune out any wayward or damaged/dead branches in winter. Generally pest free. Can be affected by fireblight in warmer regions of the UK. Sow seeds in late summer, in a pot of good seed compost and place in a cold frame. Plant out the following spring. Alternatively, low growing stems can be layered in the autumn. A. alnifolia 'Obelisk' a small tree or shrub with young red leaves that turn mid-green in summer. White star-shaped flowers appear mid-spring. Available at Thompson & Morgan. A. x grandiflora 'Princess Diana' an attractive upright shrub or small tree that produces and wealth of showy white flowers in the spring. The young foliage is pale bronze turning green in summer. Available at Thompson & Morgan. A. lamarckii (syn. A x grandiflora) produces masses of white flowers in spring followed by black fruits, and has excellent autumn colour. Height 30ft (10m). Popular cultivars include 'Ballerina' with large white flowers and 'Rubescens' with white flowers tinged in pink. Available at NotCutts, Thompson & Morgan and Gardening Express. A. canadensis also produces masses of white flowers in spring but its young leaves are covered in dense white hairs that disappear as they mature. Height to 20ft (6m). Available at NotCutts. A. laevis has copper-coloured young leaves and white fragrant flowers in late spring. Forms a small tree but can be pruned to a large bush.